Let All Pest Exterminator Richmond remove these filthy vectors from your house. 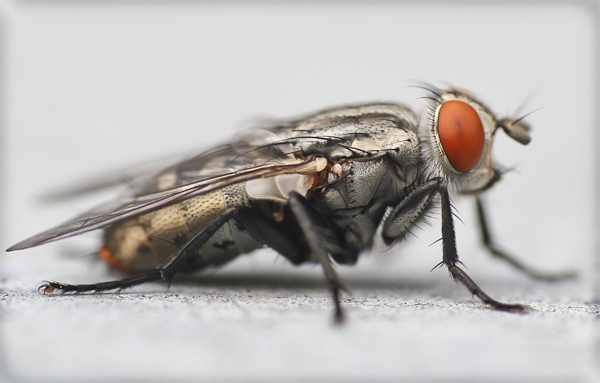 Often confused with the common House Fly, Cluster Flies are roughly the same size. Some characteristics that differentiate the Cluster Fly: they fly somewhat more slowly than the House Fly, they almost always fly toward windows on the warm side of a structure and their wings overlap almost completely, when at rest. Cluster Flies breed in the ground outside of buildings during the warm weather (late Spring into early Summer) using earthworms as a food source for the immature larva (maggots). The flies later pupate (go into the cocoon stage), then hatch as adult flies. In temperate areas, often in late August, these flies begins to migrate indoors finding any small cracks or crevices that permit entry into structures. These may include areas around window frames, door frames or eaves. Entry tends to be on the same, warm, sunny side (often the southern or western exposure) of the structure as the flies later emerge from. During the Fall, Winter or Spring months, these flies may emerge, particularly on warm, sunny days. The flies appear at windows buzzing and “clustering” around those areas to the dismay of the occupants. This fly can become a problem in virtually any structure and they have, on occasion, been a problem in sensitive areas such as hospitals, where they are especially unwelcome. Paper wasps, hornets and yellowjackets construct nests of a paper-like material which is a mixture of finely chewed wood fragments and salivary secretions of the wasps. Paper wasps typically build their umbrella-shaped nests under eaves and ledges. These wasps are not as aggressive as yellowjackets or hornets, and can be eliminated rather easily with a wasp and hornet spray sold at most grocery and hardware stores. These formulations have an added advantage in that they often spray as far as 20 feet. Treatment of wasps, hornets, and yellowjackets is best performed at night; paper wasps can be eliminated during the daytime provided you do not stand directly below the nest during treatment. Most wasp and hornet sprays cause insects to drop instantly when contacted by the insecticide. Standing directly below a nest increases one’s risk of being stung. Following treatment, wait a day to ensure that the colony is destroyed, then scrape or knock down the nest. This will prevent secondary problems from carpet beetles, ants and other scavenging insects. 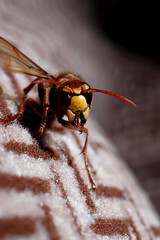 Hornets are far more difficult and dangerous to control than paper wasps. The nests resemble a large, inverted tear-drop shaped ball which typically is attached to a tree, bush or side of a building. Hornet nests may contain thousands of wasps which are extremely aggressive when disturbed. The nests are often located out of reach and removal is best accomplished by a professional pest control firm. A full wasp suit sealed at the wrists, ankles and collar is recommended when disposing of a hornet nest. Treatment can be accomplished by applying a wasp freeze-type, aerosol insecticide or dust formulation (Sevin, or Ficam,) directly into the nest opening. Hornet nests have a single opening, usually toward the bottom, where the wasps enter and exit. It is essential that the paper envelope of the nest not be broken open during treatment or the irritated wasps will scatter in all directions, causing even greater problems. Following treatment, wait at least a day before removing the nest to ensure that all of the wasps are killed. If hornets continue to be observed, the application may need to be repeated. Experienced pest control operators will sometimes remove a hornet nest which is attached to a branch by slipping a plastic garbage bag over the intact nest and clipping it at the point of attachment. This technique should not be attempted by anyone else and should only be done at night with a wasp suit. Yellowjackets are another dangerous wasp encountered around homes and buildings. Nests are often located underground in an old rodent burrow, beneath a landscape timber, or in a rock wall or wall of a building.If the nest can be located, it can usually be eliminated by carefully applying a wasp spray insecticide into the nest opening. Sevin ™, or Ficam ™, dust is also very effective provided a handduster or similar type applicator is used to dispense several puffs of the insecticide dust in to the nest opening (an empty, dry liquid detergent bottle, filled no more than halfway with dust and shaken before dispensing works well). Treatment should be performed late at night after all yellowjackets are in the nest and less active. It’s best to pinpoint the nest opening during the daytime so you will remember where to direct your treatment after dark. Approach the nest slowly and do not shine the beam of the flashlight directly into the nest entrance as this may startle the wasps; instead, cast the beam to the side to illuminate the nest indirectly and place the light on the ground rather than in your hand. Similar to hornets, yellowjackets are extremely aggressive when the nest is disturbed. It may be prudent to call a professional pest control company, particularly when access to the nest is difficult. Large numbers of lady beetles (ladybugs) infesting homes and buildings in the United States were first reported in the early 1990s. Ladybugs normally are considered beneficial since they live outdoors and feed on plant pests. Asian lady beetles vary in color. One species of lady beetle, Harmonia axyridis, can be a nuisance however, when they fly to buildings in search of overwintering sites and end up indoors. Once inside they crawl about on windows, walls, attics, etc., often emitting a noxious odor and yellowish staining fluid before dying. The Asian Lady Beetle, Harmonia axyridis (Pallas), is relatively new to this country. The beetle is native to Asia (e.g., China, Russia, Korea, Japan), where it dwells in trees and fields, preying on aphids and scale insects. The first field populations in the United States were found in Louisiana in 1988. Since then the beetle has expanded its range to include much of the U.S. and parts of Canada. During the 1960s to 1990s, the U.S. Department of Agriculture attempted to establish the Asian lady beetle to control agricultural pests, especially of pecans and apples. Large numbers of the beetles were released in several states including Georgia, South Carolina, Louisiana, Mississippi, California, Washington, Pennsylvania, Connecticut and Maryland. Adult Asian lady beetles are oval, convex, and about 1/4-inch long. Their color can vary widely from tan to orange to red. They often have several black spots on the wing covers, although on some beetles the spots may be indistinct or entirely absent. Multi-spotted individuals tend to be females while those with few or no spots tend to be males. Most beetles have a small, dark “M” or “W”-shaped marking on the whitish area behind the head. Eggs are yellow, oval, and typically are laid in clusters on the undersides of leaves. The immatures (larvae) are often orange and black and shaped somewhat like tiny alligators. Larvae complete their development on plants where their primary food (aphids) is abundant. The non-mobile cocoon (pupal) stage remains attached to vegetation by its molted skin, but occasionally may be found clinging to exterior walls of buildings. The average time from egg to adult is about one month and there are multiple generations per year. Individual beetles can live up to three years. At present, Asian lady beetles appear to have few natural enemies. As a defense against predators, the beetles secrete a foul smelling yellowish fluid from their leg joints when disturbed. Some mortality occurs at sub-freezing temperatures, although survival is enhanced within buildings and other protected locations if adequate moisture or humidity is available. In its native land, the Asian lady beetle is mainly tree-dwelling, living in forests and orchards. In Japan, it is also abundant in soybean fields. In the U.S., the beetles inhabit ornamental and agricultural crops, including roses, corn, soybeans, alfalfa and tobacco. During spring and summer, the larvae and adults feed mainly on aphids, consuming hundreds per day. As autumn approaches, the adult beetles leave their summer feeding sites in yards, fields and forests for protected places to spend the winter. Unfortunately, homes and buildings are one such location. Swarms of lady beetles typically fly to buildings in September though November depending on locale and weather conditions. Beetle flights are heaviest on sunny days following a period of cooler weather, when temperatures return to at least the mid-60s. Consequently, most flight activity occurs in the afternoon and may vary in intensity from one day to the next. Lady beetles are attracted to sides of buildings receiving afternoon sun. Studies have shown that Asian lady beetles are attracted to illuminated surfaces. They tend to congregate on the sunnier, southwest sides of buildings illuminated by afternoon sun. Homes or buildings shaded from afternoon sun are less likely to attract beetles. House color or type of construction (concrete, brick, wood/vinyl siding) is less of a factor for attraction than surface contrast. Contrasting light-dark features tend to attract the beetles — dark shutters on a light background, light shutters on a dark background, windows edged with light-colored trim, gutters and downspouts on contrasting siding, etc. Dwellings near woods or fields are especially prone to infestation, although those in other locations can be infested as well. Typical locations include cracks around window and doorframes, behind fascia boards and exterior siding, and within soffits, attics, and wall voids. Structures in poor repair with many cracks and openings are most vulnerable to infestation. As temperatures warm in late winter/early spring, the beetles once again become active. This usually occurs first on the sunnier, southwest side of the building. As awakening beetles attempt to escape to the outdoors, some inadvertently wander inward, emerging from behind baseboards, walls, attics, suspended ceilings, etc. Since lady beetles are attracted to light, they are often seen around windows and light fixtures.